Effective January 23, 2017, Indian nationals must complete an online pre-arrival registration in order to enjoy the current 14-day visa-free visit or enter Hong Kong during transit. Please note that this registration is not necessary if you are transiting by air and not leaving the airport transit area. Each pre-arrival registration for an Indian national will be valid for six months or until the expiration date of the Indian passport linked to it, whichever is earlier. Provided that normal immigration requirements are met, a registrant may use a valid notification slip together with the specific and valid Indian passport to make multiple visits to Hong Kong visa-free. On each visit, a registrant may stay in Hong Kong for up to 14 days. Travelers who want to visit Hong Kong must have an Indian passport with at least 6 month validity from the planned date of entry. On each visit, the registrant may stay in the HKSAR for up to 14 days. Visitors must depart Hong Kong within 14 days. If there is a special/urgent need to stay longer, visitors may request an extension of stay application up to 7 days before their stay expires. Each pre-arrival registration for an Indian national will be valid for six month or until the expiration date of the Indian passport linked to it, whichever is earlier. In case pre-arrival registration is unsuccessful, Indian nationals who intend to visit Hong Kong can apply for an entry visa from the Immigration Department directly. Super rush processing times for Hong Kong Pre Arrival Registration are approximately 15 minutes. If the applicant renews or replaces his/her Indian passport or changes his/her personal details after pre-arrival registration, the registrant must re-apply for pre-arrival registration using the new passport or personal details. We suggest that passengers verify the information, print it and bring a physical copy of it on their trip. The check-in staff at the airports can also verify the registration on their system. However, we highly recommend clients to keep a copy of it on their electronic device, or preferably printed out. What are the requirements for an Indian national to apply for a PAR? Holds an Indian passport valid for at least six months. Intends to visit or transit (except for direct transit by air and not leaving the airport transit area) Hong Kong for a stay not exceeding 14 days. PAR is not applicable to Indian nationals who have the right of abode or the right to land in Hong Kong, are on unconditional stay in Hong Kong or have a valid permission to remain in Hong Kong for employment, study or residence. How much does a Hong Kong PAR cost? How long does it take to obtain the Hong Kong PAR? How long is a PAR valid for? It is valid for 180 days (6 months) from the date of issue. How long should the validity of my passport be? Applicants who want to visit Hong Kong must have an Indian passport with at least 6 month validity from the planned date of entry. Is a PAR valid for study or work? No. 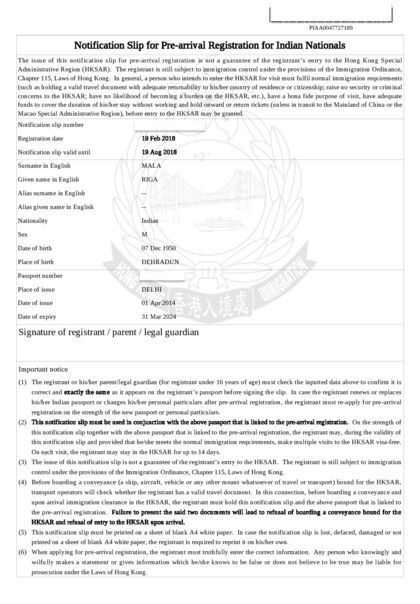 A person admitted as a visitor in Hong Kong is not allowed to take on any employment, whether paid or unpaid, establish or join in any business or become a student at a school, university or other educational institution in Hong Kong. If you wish to enter Hong Kong for employment, study, training or residence, you should apply for an appropriate visa to the Immigration Department of Hong Kong under the existing arrangements. What should I pay attention to during my stay in Hong Kong and upon departure? You should carry with you the landing slip and your Indian passport during your stay in Hong Kong. In general, you will only need to present your Indian passport for immigration clearance upon departure. What are the specifications for printing the PAR notification slip? The notification slip must be printed on a sheet of blank letter-sized white paper. Double-sided or reduced printing will not be accepted. What should I do if the data on the notification slip does not match that on my Indian passport? Data inconsistency between the notification slip and your Indian passport will render the registration invalid and lead to refusal of your boarding a conveyance bound for Hong Kong and entry to Hong Kong. You should re-apply for PAR by inputting information which is exactly the same as it appears in your Indian passport. I intend to visit Hong Kong together with my wife and children. Do we need to apply for a PAR individually? Yes. You and your family members are required to apply for a PAR individually. Can I apply for a PAR outside of India? You can register online from anywhere in the world. You are allow to stay for a maximum of 14 days per entry. Is the PAR valid for multiple entries? Can I apply for a new PAR if my last registration is still valid? Where and when can a visitor submit an application for an extension of stay? Generally speaking, visitors must depart Hong Kong before the expiry of their stay. If there is a special/urgent need to stay longer, visitors may make an extension of stay application up to 7 days before their stay expires. Applications will be considered on its own merits. You will receive what is called a Notification Slip. You must present this upon entry..
As you may already know, Hong Kong is part of China but it is an autonomous region within its own rights. But besides that, Hong Kong is a magnificent travel destination that many people choose. It is true that most people think that Hong Kong is mostly visited by business people, but apart from that, the beautiful region has a lot more to offer than skyscrapers. You must have heard about the ‘New York of Asia’, but you would be surprised to know that Hong Kong is much more than that. It is a place that can help you create a bunch of wonderful memories. The people in Hong Kong are very friendly, and you will rarely see someone looking strange at you. They embrace tourists, and they are very polite. People who say that Canadians are the most polite people have never traveled to Hong Kong. They are so focused on not offending anyone that it is ridiculous. At the same time, of course, you must be careful not to offend anyone as well. One good example is how you leave your chopsticks in your bowl of rice. You cannot leave them upright since it is associated with funerals. It is not offensive in the real sense of the word, but it is upsetting. One thing that you would be surprised to know is that Hong Kong is not just an urban area. In fact, more than a half of its surface area is countryside. Yes, you have the famous skyline, and media almost always portrays the urban area only, but you have a lot of nature around the metropolis. You have beaches, forests, and whatever else you can think of. You can explore for days and still cannot cover about everything. Plus, there are a lot of islands, and getting on one is fairly easy. As for getting around town, Hong Kong has about 5 ways to do that. Most importantly, Hong Kong’s public transportation system is one of the most efficient in the entire world. Not to mention that it is crazy cheap to catch a ride almost anywhere. You do not have to worry about getting ripped by some taxi driver. As mentioned before, the people there are very friendly and fair. You will not be scammed into anything. Another thing that I think you will like while on vacation is that you can walk on the street or go to the beach with an alcoholic beverage open. In Hong Kong, you are allowed to drink in public places. The legal age for drinking is 18, but most countries do not let people walk around with an open bottle of alcohol. Not in Hong Kong. There, you can enjoy this, even if you do not plan on drinking on the sidewalk. At least you can enjoy a cold beer at the beach, something that is not possible in most civilized countries around the world. The food is yet another thing that is more of an experience than anything else. The Chinese food you ate in western countries is a poorly made joke in comparison with the food you will find in Hong Kong. It is so colorful, smells so good, and the spices are to die for. Plus, the people of Hong Kong like to share, so when you go to a restaurant, you do not have to order a portion for each person. Instead, you can order one plate of everything you want to eat and let the food go around the table. The advantage of doing so is that you can get to taste multiple dishes at the same sitting. Neat, right? As for communication, you should have no issues in getting around. If you had no idea, Hong Kong was a British colony until 1997 when it was ‘handed’ to China. As a result, a lot of people there are fluent in English. Even those who are not fluent can still understand and talk to you. Maybe not well, but enough so that you can understand each other. On the same note, the people of Hong Kong do not speak Chinese or Mandarin. That is a common misconception. In fact, they speak Cantonese. That is a whole lot different than the first two. Learning a phrase or two, like greeting formulas, may work in your favor. That is because people there will get very excited if you speak their language. Even if it is something as small as a ‘good morning.’ Something that you will find surprising is that shops are open until very late. I am not referring to hypermarkets or big stores. I am talking about small corners shops. If in the western civilization these stores are open until 6 or 7 PM, in Hong Kong, they are open until 10 PM or even more. If you want to buy some things from a convenience store at 11 PM, chances are that you are going to find one open. Ask the locals. They will know better. The airport in Hong Kong is one of the largest in the world. You can catch a flight to almost anywhere from there, which is a big plus if you plan on visiting more than one country in a single trip. One rule that you need to remember here is regarding escalators. Always remember to walk on the left and stand on the right. Aside from the things mentioned above, remember to take in the streets of Hong Kong. You will probably see people taking photos everywhere, locals or otherwise. That is because Hong Kong’s streets are very charming. The small shops with all kinds of decorations, the markets, or even the colorful decorations on some of the building add to that charm. Make sure to take a lot of pictures because you will want to remember the scenery. Other than that, remember to live the Hong Kong experience with everything it entails, and remember that the locals take great pride in their history. Make sure to learn some of that as well. Do I need a Hong Kong tourist visa? How to obtain a Hong Kong travel visa? Is a Hong Kong visa on arrival available? Is the Hong Kong visa on arrival for Indian citizens still available?